John F. Kennedy was sworn in as the 35th President in 1961. One of the greatest orators to ever serve as President, his inspirational speeches helped carry the nation through some of its most turbulent times. His Presidency was cut short by an assassin's bullet on Friday, November 22, 1963. Today, more than 50 years after that tragic event, JFK remains one of the most beloved and revered men ever to hold the Office of President. 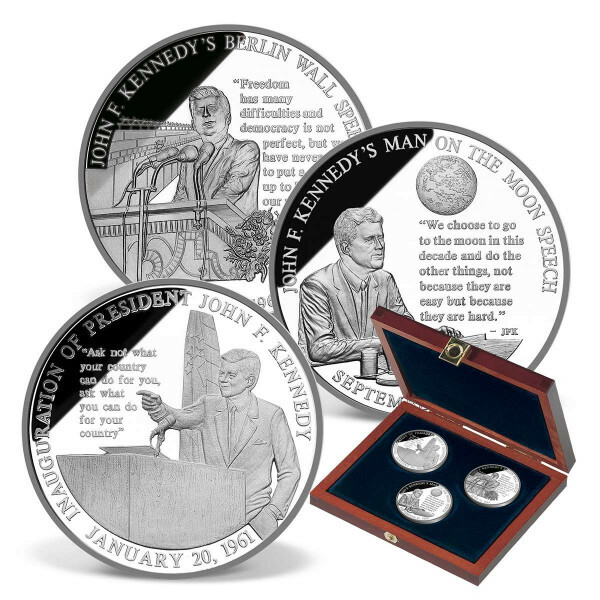 This magnificent three- piece set celebrates some of President Kennedy's most popular orations, including his Civil Rights speech, his Nuclear Test Ban speech, andhis famous Berlin Wall speech. This AMERICAN MINT EXCLUSIVE set contains three solid silver coins celebrating the most beloved President of our time. Minted in solid .9995 fine silver, eachcoin features a highly detailed engraving of JFK with quotes from his most famous speeches. These coins are minted to the highest quality "Proof" standard. Presented in a beautiful wooden collector box, custom-crafted to preserve and display your precious coins, this incredible set of solid silver coins is limited to only 150 sets worldwide.